Whoever said small PCs couldnt deliver performance? That might have been arguable in the old days, but given our current computer technology, size is no indication of computing power. 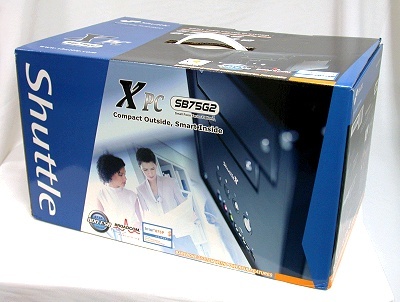 On the consumer front, Shuttles Small Form Factor (SFF) XPC systems (and other vendors SFF systems) have more than proven their might in performance, but maintaining a small build which is unobtrusive and fun to work with. Since these SFF systems can in fact replace a full-fledged tower system for those who dont require expansion or take up other roles solely relegated to computing power, Shuttle has designed a new SFF system designed around the Intel 875P (Canterwood) Northbridge and the Intel ICH5R Southbridge. This system, by virtue of the chipset specification, will contain no integrated graphics subsystem. Instead, it will deliver extra performance thanks to the i875Ps built-in Performance Acceleration Technology (PAT) that capitalizes on better memory access patterns and will depend on add-in AGP graphics cards for powering the graphics subsystem. This new Shuttle XPC SB75G2 is being marketed as a powerhouse for performance enthusiasts who need an SFF solution. We even foresee such systems could be an appropriate option for LAN gaming centers or at least the up-market types that charge more for their services and can afford to maintain a life-style theme. Linking up a couple of XPC systems for a server solution sounds good too and such setups have even been accomplished, but those would probably be better off with integrated graphics because a mandatory AGP graphics card solution such as required on the XPC SB75G2 offers very little tangible gain. However, it would still serve as an excellent small all-round workstation for multimedia and content creation purposes.